Olive oil is to my kitchen as is salt. The food I cook would be nothing without it. As one of the most fraudulent ingredients in the world, the story and sourcing of the olive oil is extremely important to me. If you haven’t read the book Extravirginity, which reveals this story of globalization, deception, and crime in the this industry, put it on your list immediately. After reading the book in 2013 (I still have the date marked inside the cover), I did a lot of research to find a U.S. based olive company that I could access, that was doing it the right way, from olive grove to bottle, to store, to my house. But it also had to taste really, really good. Since that time, the timeless green California Olive Ranch bottle has been in my cupboard, doing everything from baking cakes, to roasting my favorite vegetables, and searing meat to perfection. 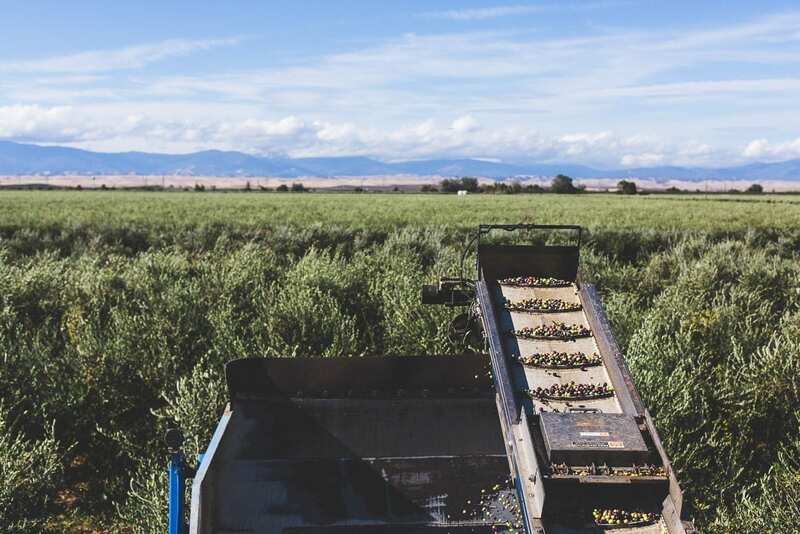 So when I received an invitation to see the olive harvest on one of their farms near Sacramento, I felt like I was going to see the golfer Jack Nicklaus play at Pebble Beach, the one I respected most in all of my years of playing, . The experience was enlightening and humbling, opening my eyes to the entire process and the passion of the families who work tirelessly to bring us such an integral part of cooking. It also brought me closer to four wonderful people in the blogging community: Betty (who took the picture of me above), Nik, Kimberly, and Erin. 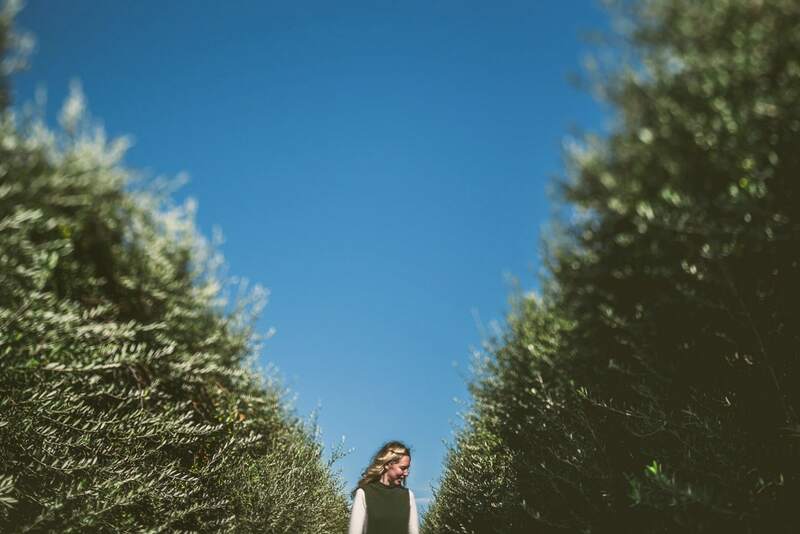 I don’t know what I was assuming the field would look like, but I had no idea how beautiful olive groves are. Rows and rows of mystical trees with long branches, swaying in the wind with clusters upon clusters of olives, almost like grapes. 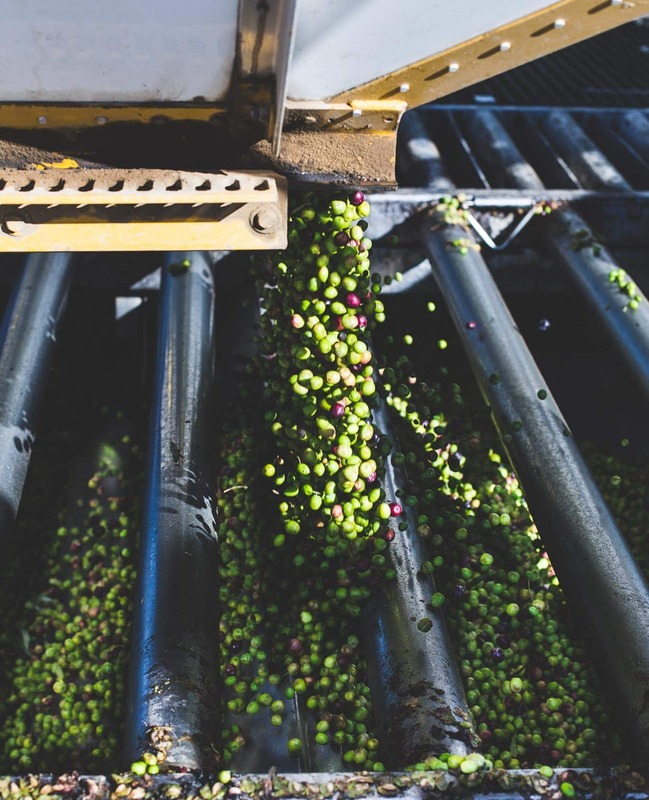 California Olive Ranch innovated a particular mechanical harvest method to make extra virgin olive oil available to more people around the country. That big over-the-top harvester you see above (which we all rode on the top deck to get some amazing photos and the ultimate bird’s eye view!) allows them to harvest the fruit at their perfect ripeness. 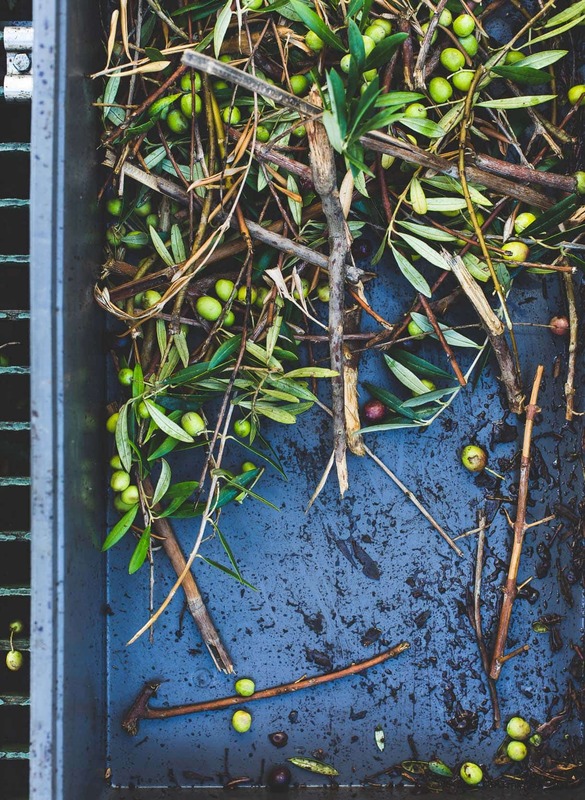 The olives never touch the ground, minimizing any damage to the fruit from dropping. You can look at an infograph of the whole process here, which shows their First Cold Press Method (no heat ever applied). and I have to say that one of most interesting parts was seeing the oil and water separation via a centrifuge, and becoming an olive oil waterfall that then went to sleep in 12 story tanks. As you can see by so many pictures, the visual story is quite captivating. 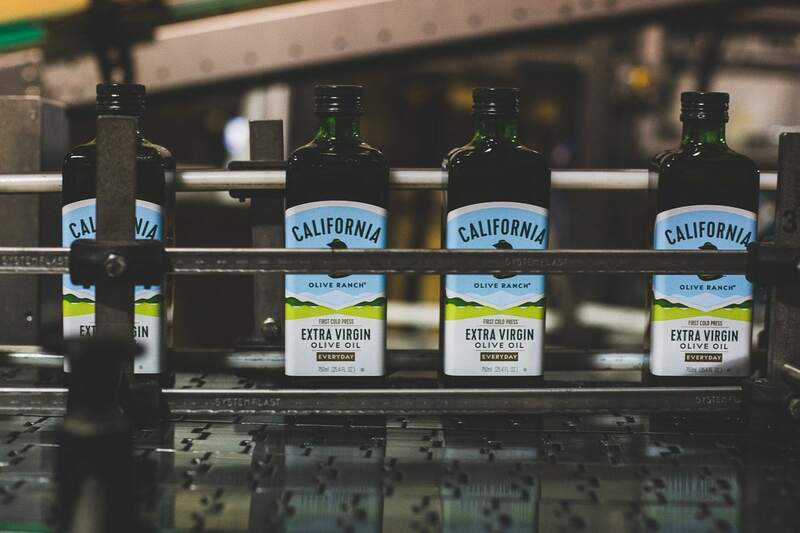 I absolutely love California Olive Ranch’s mission, to bring more people quality olive oil. 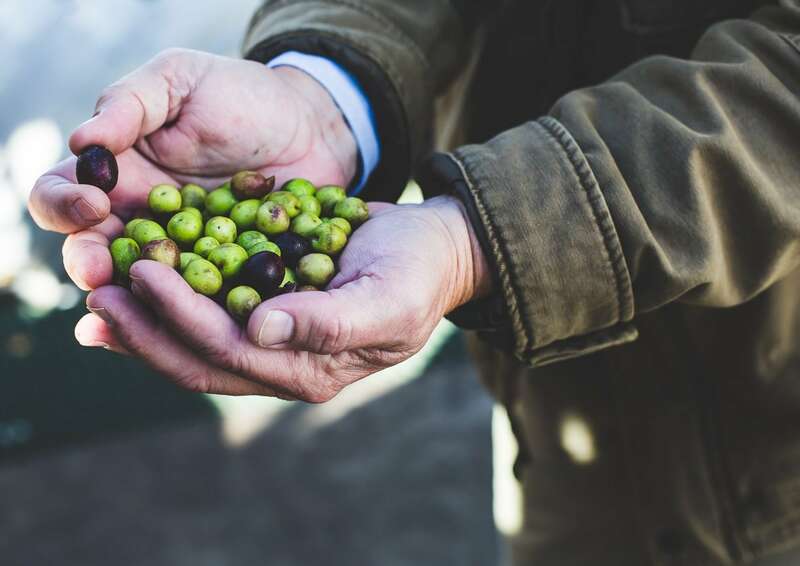 And their approach, growing olives uses time honored farming techniques while fully embracing modern technology and focusing on sustainability. Their fruit is grown by 70 family farmers around the Sacramento area who are committed and proud of what they do. And by all of us around the country supporting them, we’re supporting local too, even when it’s different than our coordinates on the map. 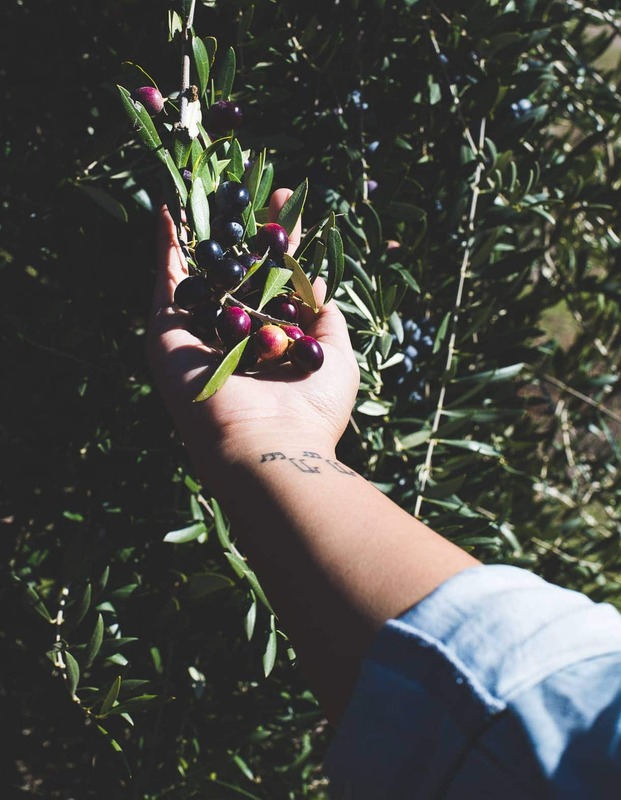 I’m so honored to partner with them this year, and bring you recipes that hopefully inspire some new ideas for a common ingredient, and also talk about the different varietals of extra virgin olive oil as I go along. Heat Myth: Forever I thought I wasn’t supposed to cook with olive oil at high heat. All those people that told you the same thing – they were WRONG. With high quality, fresh olive oil that is. Such will stand upwards of 425 degrees, well above the ideal temperature for frying food around 350 degrees. Low quality will burn because it has less acid, has probably been cut with vegetable oils, and may have particular matter from not being separated properly. Color: Greener olives generally make more intense, grassy flavors and less oil. More mature purple fruit will make mild and buttery oil that is often golden in color. Bone Health: most of us know that olive oil is a heart healthy fat, but what I didn’t know is that is also helps improve bone mineralization and calcification. It helps the body absorb calcium, which is a key player in preventing osteoporosis, aiding in thickening the bones. And as I someone who was diagnosed with osteoporosis at age 25, I need all the help I can get. I’m a firm believer in homemade hummus. Storebought, no matter which way, which how, just doesn’t compare. That’s not to say I’ve never purchased a tub for convenience when grocery store hangry or traveling. But if able, I’ll be whirling all up in my food processor, going so far as peeling the chickpeas too because that’s how the smoothest hummus is made. This recipe however, uses white beans, and was inspired by Jennifer Farley‘s new cookbook, The Gourmet Kitchen. As I was paging through the book, her Loaded Hummus caught my eye stacked with all sorts of things like feta, olives, and sun dried tomatoes. As I read the headnote, she talked about her preference for white beans because of their smoother consistency. In all honesty, I decided to try her technique because I’d sworn off white bean hummus. To me, it seemed like it was trying to be something it wasn’t, always a little pasty and grainy. After making her recipe, I figured out what I was doing wrong…. 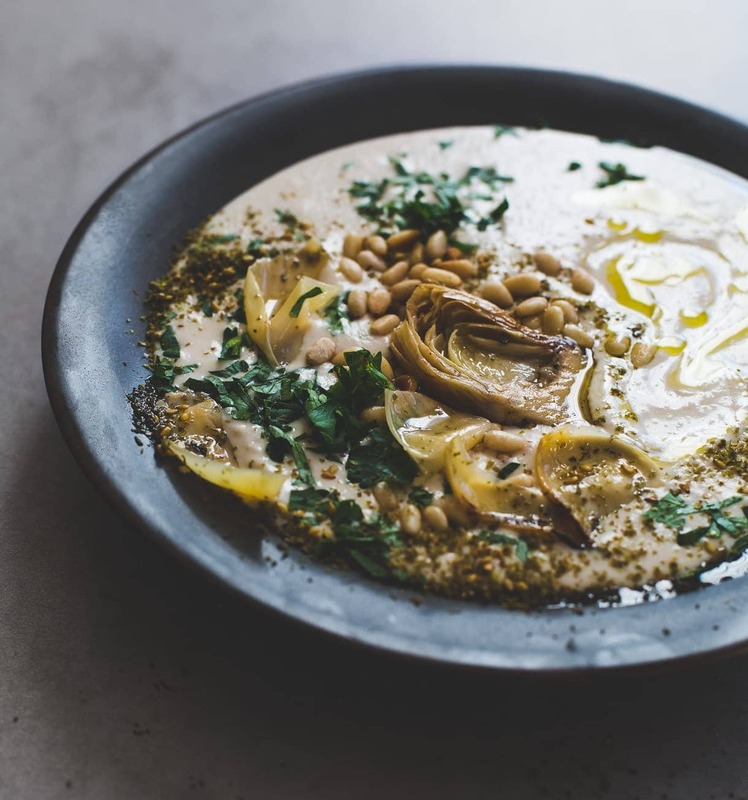 I had been afraid of using a little water, and not enough tahini/olive oil, the healthy fats that allow it to blend and emulsify into the silky dip that it is. I made it a few times after, perfecting my own version. I found that using the water from the beans instead of tossing it was the best liquid, having some starch in it to make it even creamier. 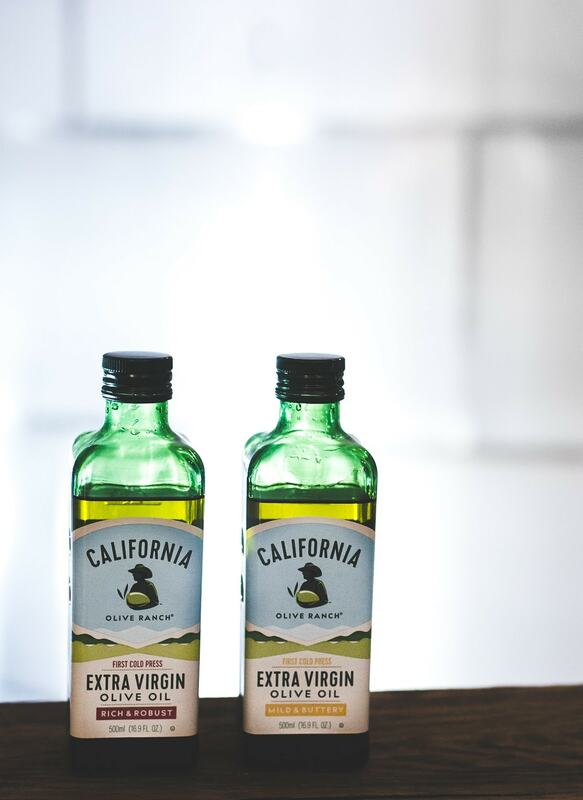 Then a higher proportion of Everyday California Olive Ranch Everyday Olive Oil to really let the beautiful fruity flavor of the olives shine, and lots of lemon for brightness. I topped it with marinated artichokes (they’re actually grilled and marinated, from Trader Joe’s so they add a nice smoky flavor), toasted pine nuts, za’atar, and parsley. Incredible flavor and textures going on….. It didn’t last long – as in two days. I went the cracker route first, then under a bed of roasted vegetables, and lastly on an egg sandwich. You really, really can’t go wrong. Enjoy, xo. 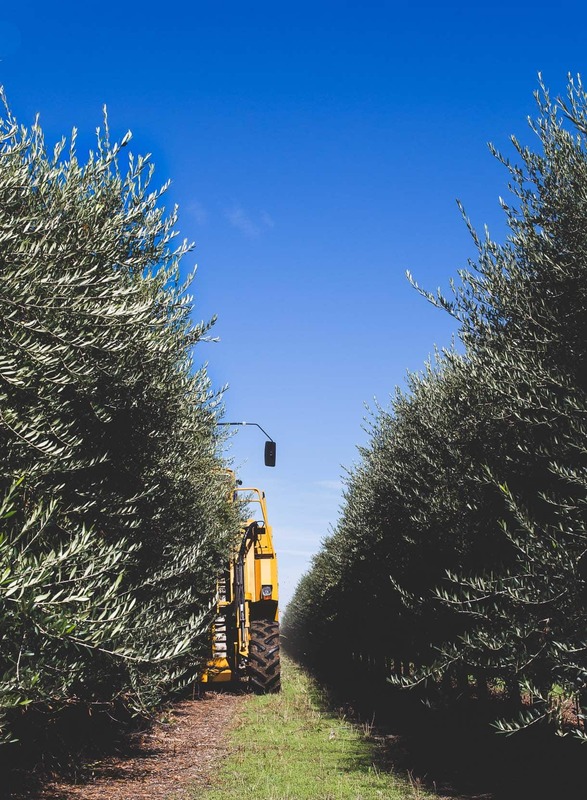 Thanks to California Olive Ranch for sponsoring this post, the chance to see the harvest, and continued partnership this year. You’re in my kitchen every day, making food taste great in the most honest way. Can be made 3 days ahead, just save the toppings for right before serving. Place the garlic, beans, tahini, and olive oil in a food processor. Blend and processor for 20 seconds, stop to scrape sides, then blend for 20 more seconds. Add bean water, lemon juice, salt, and black pepper. Puree for two minutes, just keep it buzzing, to create the really really smooth texture. At this point you're ready to garnish and serve. But if you'd like it to be a little thicker, you can refrigerate for 15 minutes. 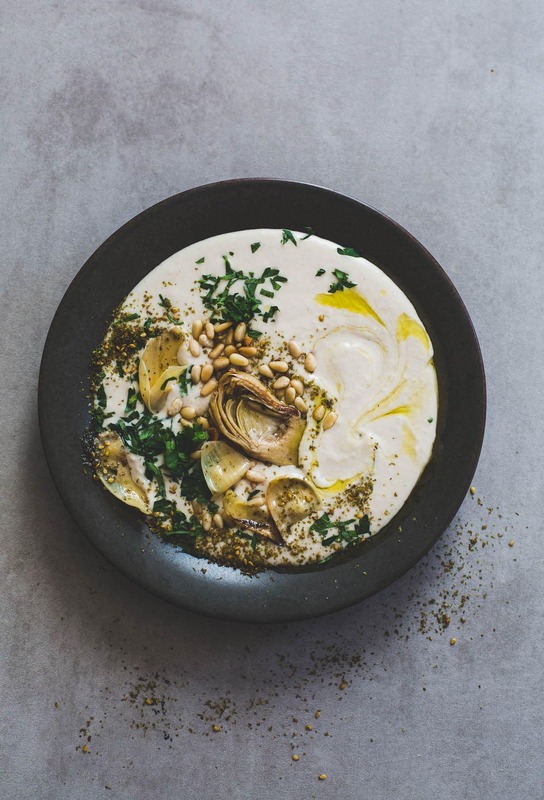 Spoon into bowl and top with parsley, pine nuts, za'atar, and artichokes. Serve. Their olive oil is actually one of my favourite brands to buy! It’s delicious. I haven’t read Extravirginity but it’s been on my reading list for a while! I’m currently reading Salt: A History of the World and the author talks about the effort that goes into olive harvesting and the difference between olives for oil and olives for eating, which was so interesting for me to read. I’m also a firm believer in homemade hummus- even though storebought is not bad, I can’t bring myself to buy something that I can make a lot better by myself at home! Amanda, this is stunning! That photo of you remains one of my favorites from that trip, and I just loved getting to know you. 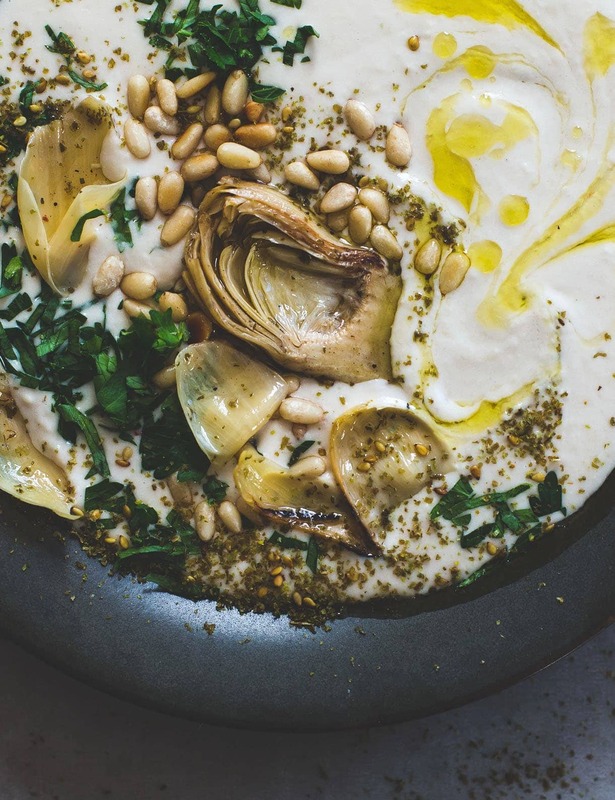 I’m going to go and make this silky smooth hummus right now! We moved from an area that had a lot of authentic Middle Eastern food and this looks absolutely perfect! So smooth and creamy! And California Olive Ranch olive oil is the BEST! crazy how the media can shift something – I feel like they were really saying this when people were turning away from using canola oil. i’m going to try frying some sort of tempura vegetable in olive oil this winter! :) real food is so pretty! thank you for the kind comment. Yes, this looks awesome! I need this in my life ASAP! So creamy! One of my favorite appetizers. Thanks for this amazing recipe. I made this for a party today and it is delicious. Your photography is stunning as well, so glad i stumbled upon your site. Do you use white cannellini beans or some other type of white bean? I used white cannellini, but you could also use navy beans. I hope I’m not committing a sacrilege, here, but I made this outstanding hummus today, using Great Northern beans & Jif creamy PEANUT BUTTER in place of the tahini. Plus I subbed 2 teaspoons of sesame oil for 2 teaspoons of the olive oil (California Olive Ranch is the only kind I buy), to give it some sesame flavor. I was almost afraid to taste it, but – oh, boy – is it good! Thanks for such a quick, easy, and delicious recipe. When I get some tahini, I’ll make it as-written. I just made it and it turned out delicious. I topped mine pita with the hummus and schug/zoug and it was a perfect pairing! Next time Ill add more lemon. so glad you liked the recipe! and so yummy with the pita.